Blue sky! After several continuous days of rain, it was good to see the sun this morning at Volunteer Park. 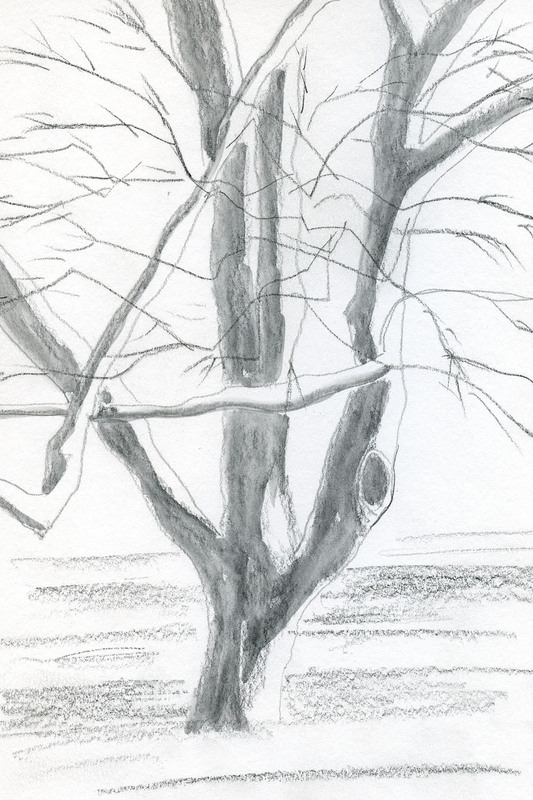 Several hardy Friday sketchers took advantage of it to sketch outdoors, but despite wearing two layers of Polartec, I couldn’t quite bring myself to do it. I did, however, have a great view of William Henry Seward from my parking spot. 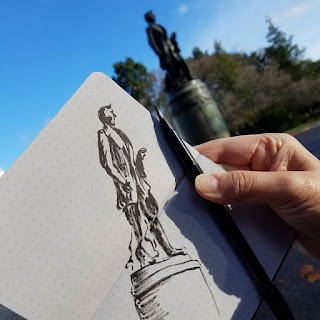 Nostalgically I remembered the last time I had sketched the monument more than four years ago on a warm August day – warm enough that I had to seek shade instead of my car’s heater. 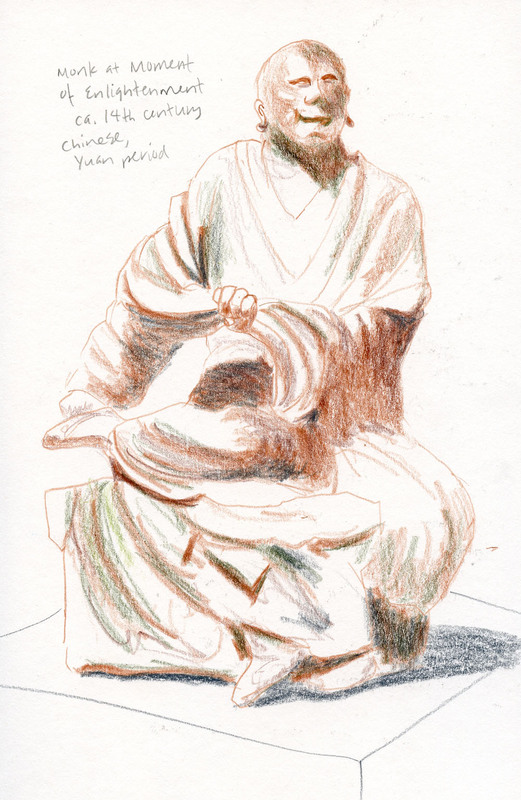 After that I ducked inside Seattle Asian Art Museum, which will be closing soon for major expansion and restoration. 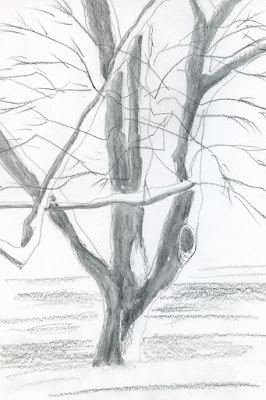 First I went to the rear of the museum where I knew the tall windows look out on some of Volunteer Park’s old trees – a good opportunity for a value study. Then I walked through the sculptures in the museum’s permanent collection and found one of a Buddhist monk “at the moment of enlightenment,” whose expression was nothing less than joyful. Or so I thought. The placard, however, said, “it is a moment of intense mental struggle and often associated with actual physical pain.” Well, he looked happy to me. 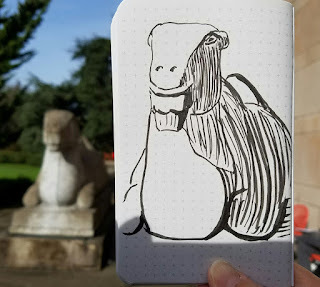 By the time of the sketchbook throw-down, it was warm enough to stand outdoors for the few minutes it took me to capture one of the museum’s stone camels, who also looked happy to be in the sun. Good to know the museum is still open. I love going there and the conservatory. 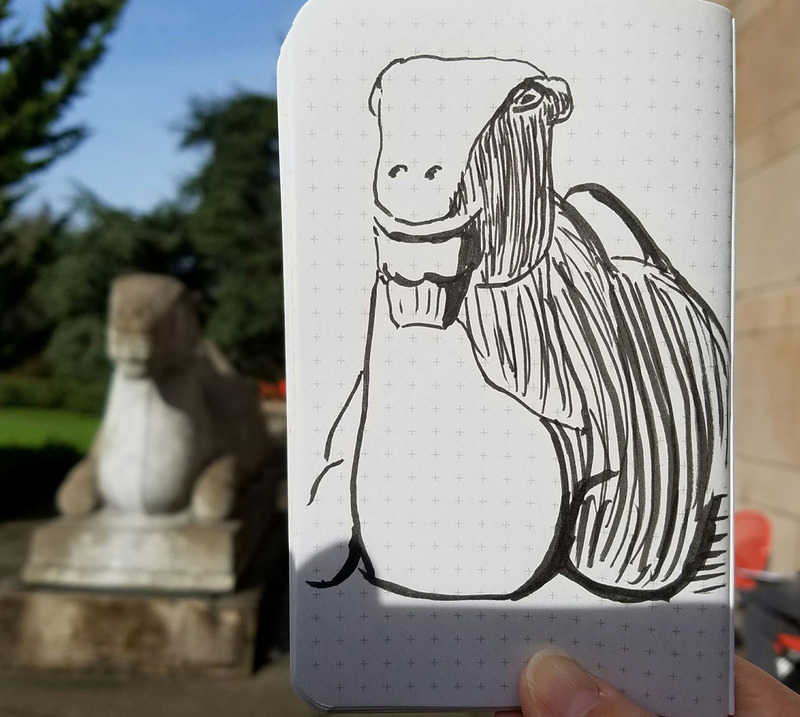 What luck to have clear blue skies and enough sun to stay warm enough to sketch.